Napoleon in America is a ‘what-if’ historical novel that combines a variety of styles – epistolary, newspaper article, and regular novelistic narrative – to create a work that reads like a very well-written narrative of history. Given that the author is necessarily working with an entirely fictional world – one in which Napoleon escapes from St. Helena to the United States – the fact that she can create such an effect is quite remarkable. The reader is made to feel as if he or she is reading about actual historical events…. Along with the Big Men of the time, Selin deals with the Big Ideas of the time…. Liberalism and dictatorship and whether Napoleon is really a liberal or little better than the kings he likes to depose are discussed – as no doubt they were, in fact, discussed historically. We see some of the conflicts within French Liberalism – and some of the contradictions…. Overall, Selin’s book goes beyond what we would expect to find in a historical novel whose main character is a major historical figure. A traditional historical novel would have the characters doing all the major, public actions the history books tell us happened. Selin has to do something quite different. She has to first know what did in fact happen during the historical period in question; she then has to understand Napoleon well enough to understand what he might do in circumstances other than those in which he did, in fact, find himself; and then she has to create a realistic alternative to what did in fact happen, understanding the butterfly effects of a Napoleon in America. 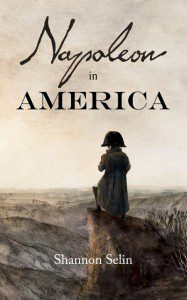 Napoleon in America is a ‘what-if’ historical novel that combines a variety of styles – epistolary, newspaper article, and regular novelistic narrative – to create a work that reads like a very well-written narrative of history.